The campaign of the Mordant 13th across the galaxy has uncovered numerous Warp-bound mysteries...and where such mysteries are found, eventually the inscrutable Eldar must involve themselves. So it was that Mega-Battle 4 in the yearlong Apocalypse Lucky 13s campaign found the Imperium's struggle with daemonic forces crawling up from the Warp pits turned into a side show, as Eldar of every sort--craftworld, dark and raider--swept in...and in North Texas' particular corner of the planetwide battles that ensued, a true Eldar Civil War developed, as rival Phoenix Kings led each side into battle, Scorpion-against-Scorpion, Karandras-against-Arhra...with the full muster of the Inquisition squarely in the middle! The being which claimed to be the dethroned Phoenix King Arhra led three full Dark Eldar Kabals and two Eldar Pirate Raider bands into battle, their center held by an eruption of Khornate might from the daemon pits below--led by an almost-unimaginably-powerful Avatar of Khorne itself! Rightful Phoenix King Karandras countered with a Craftworld Eldar force that included a magnificent Revenant Titan, siding with an Imperial faction that had, in response to the augurs and portents, mustered no less a force than *six* Inquisitors of the three major ordos, a full Grey Knight Commandery, a Battle Sister Canoness, a Space Marine Chapter Master and two Baneblades! Battle focused on an erupting Daemon Pit, dead-center on the main highway through a ruined city; at the end of it, Karandras had been striken from the fighting by taking full-on a close range Pirate fire dragon volley, but the space marines rescued his fallen form, contesting that objective, while Arhra paid for an extremely aggressive flank attack into the Imperial artillery lines when a Callidus assassin put an end to his vainglorious attempt to reclaim the title of Scorpion Lord, and the Adepta Sororitas held that objective for the side of Order. Disorder set up their forward command in a gilded ruin which the Imperial forces never really threatened, then snuck Dark Eldar mandrakes into Order's own forward command building, to contest it; the fate of the conflict thus devolved down to the outcome of the struggle for the descrated altar over the Daemon Pit in the dead-center of the fighting: an almost superheroic effort by the minions of Inquisitor Solomyn Kaine and the tenacious Wraithlords and Wraithguard of Karandras' Craftworld appeared likely to sweep it clear of every Khornate daemon which bubbled through into the Material world...but at the end, even as daemon princes, Soulgrinders, Juggernauts and the Avatar itself fell around them, the two remnants of a squad of bloodletter daemons remained on the altar, to contest it, as well--and with that, the enigmatic Eldar withdrew from both sides, leaving the conflict a draw, the forces of the Inquisition bloodied and confused...but still standing. Kudos to the Mega-Battle's participants, all of whose forces had their moments in the sun: Dark Eldar Kabalists Avery, Jackson and Eric, Eldar Raiders Matt and Jeff, and Daemon lord Gama and Craftworlder Jack and his Imperial allies Josh, Kyle, Forrest, Bill and David. The unique angle of having rival Phoenix Lords Karandras and Arhra (if that was in fact truly Arhra!) take centerstage in this 'Burn the Witches' Mega-Battle gave it a completely unique flavor, as because of this rivalry, in our battle Eldar actually attacked Eldar; this was a bit of Mega-Battle backstory created by the players themselves, which makes it the best sort...and the struggles of each Phoenix King, on opposite flanks of the battlefield, became the highlights of the day. As the first Apocalypse Mega-Battle of the Lucky 13s campaign to be fought under the new V5 40K rules, the predominance of available saves in the new edition took center stage as the event's defining characteristic: the utter carnage which typified the three earlier Mega-Battles was greatly diminished this time around, as both sides--but especially Disorder, and at key times--made a law-of-averages-shatteringly high percentage of cover and invulnerable saves (greatly helped by rerolls from Matt's Farseer, who as result rivaled Order's Calidus assassin for 'model of the game'). This battle was significantly higher in infantry (and commensurately lower in superheavies, with only five total ontable, none of which blew up), as well, which magnified the effect. At the end of the day, characters who have achieved renown since Lucky 13s began added to their reputations (and some new 'characters,' most particularly David's 'invulnerable' super-Rhino, etched their own fame! ), over 27,000 points of men, aliens and daemons clashed, and twelve North Texas players edged closer to the necessary thirteen event stamps to join the hallowed roster of the Mordant Imperial Guard...the Lucky 13s! Thanks and well done to them all! On August 9th, at HobbytownUSA Dallas, the Mordant 13th 'Lucky 13s' find themselves in peril again, this time trapped atop a questionably-dormant daemonic pit and smack in the middle of a civil war between the most enigmatic of forty-first millennium races--the Eldar! Time to call in the Inquisition! All specific conditions following supersede any information presented in the general scenario for the fourth Apocalypse Campaign mega-battle found on the Games Workshop website, upon which it is based. SETUP: No Mans Land will be pre-set on the diagonal centerline of two 6'x4' tables, creating an 8'x6'' battlefield. Choice of Deployment side will be diced for between side commanders. All Eldar units will begin the game in Strategic Reserve *unless* they field an Apocalypse Datasheet which requires otherwise, in which case the Datasheet rules stand, or unless they are a side commander, in which case they may choose to begin the game deployed. All other Scenario special rules and conditions, as outlined on the website, apply. Participants must be able to field a force themed to this specific mega-battle. In this confrontation, the Imperium will be primarily represented by forces of the Inquisition and the Mordant 13th, who will be confronting Eldar (both Craftworld and Dark). There will be six 'Imperium' slots available for sign-up, and six 'Disorder' slots available for sign-up, with an alternate for each. Dark Eldar are restricted to the 'Disorder' side--but Craftworld or Raider Eldar players may choose either; their motives, as always, remain their own. Desire to participate in these events has been high, and several players of armies themed to *this* mega-battle have deferred in previous events to players whose forces were better themed to those; please extend the same courtesy here, and only sign up for a slot which you have an army to properly represent. 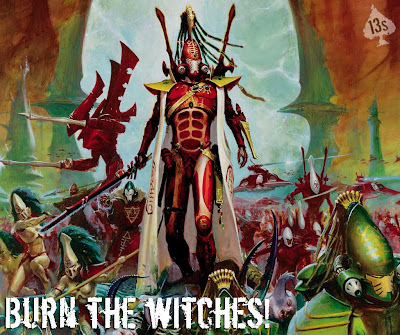 I cannot stress this enough: this is an Eldar and Inquisition themed event, and those forces have not had the chance for primacy before; please let those players have their chance to shine now. Participants must be signed up at HTUD by end of business Saturday, August 2nd (one week in advance of the mega-battle on August 9th), and must provide an active email address which they personally will be able to check during the subsequent week leading up to the mega-battle. This is critical: pre-planning amongst the six generals goes on for the event the entire week prior to the mega-battle, and having even one participant sign up and then not be available for such planning because they did not follow this sign-up regulation negatively impacts all other players. It should go without saying, as well--but as it has already happened: players who do not know their army rules or codex should not be signing up for an event of this magnitude and complexity. Though HTUD and other retailers regularly run learning-oriented events--this is not one of them. Points for the mega-battle will be 13,000 per side--divided as follows: the players on each side will be provided with the names and email addresses of their teammates, and each side will have the entirety of the event-preceding week to coordinate with each other and the Event Moderator on everything relevant to the Saturday mega-battle. A side commander will be determined for each side, and collectively the players on each side will determine which player will bring what units to the mega-battle, and in how many points; a player on each side will create an overall army list *for the entire side* (just one list, including everything, though broken down by individual participant's 'armies'), a copy each of which will be presented to the Moderator and the opposing side commander on the day of the battle. Strategy, tactics, force composition, Apocalypse Datasheets, Apocalypse Assets--everything will be decided by the participating players themselves, in the week leading up to the mega-battle...essentially extending the event to a weeklong amount of fun, instead of just one day of it! Thus the absolute requirement for daily email access in the event-preceding week. All models used must be at least assembled to properly represent their weapons and equipment, and should preferably be at least primed; additionally, priority in assembling the joint army lists for each side *must* be given to fully-painted models. Priority should also be extended to those things which make Apocalypse battles unique: superheavy vehicles, datasheet formations, custom-created models, etc should all be 'first choices' in the unified army list. As result, players will not have equal points amounts, nor should they expect to; every player will have a sufficiently large force to occupy them on the day, but one player may wind up bringing only 1000 points of his models, while another may bring 4000 (given the priorities noted above). However, because this will not be determined until the event-preceding week, no player who cannot field a minimum-sized Apocalypse force for the slot they claim, as described in the Apocalypse main rule book, 3000 points, should sign up for a slot in this event. Apocalypse Datasheets from the Apocalypse rulebook, Apocalypse Reloaded, the official GW website and the Forge World Apocalypse book are accepted without review; any vehicle or formation using a Datasheet from any other Forge World source, any unofficial website or created through VDR *must* be pre-approved by a moderator before its inclusion in any army list for either side. Approved Datasheets from the Datasheet Creation Competition may be used but the final, edited version, available for download from http://www.adeptusnorthtexas.com is the required one and an event moderator must be notified of its intended use in advance. Before signing up, participants must insure they are able to devote the time to the event it will require; everyone understands the demands real life can make, but if real life on that weekend might require an early departure, players should not sign up to participate. The mega-battle will start as soon as HTUD opens at 10am; participants can either bring a lunch or join with other participants to have inexpensive pizza delivered; and there is a good possibility HTUD will allow play to continue beyond the 6pm store closing, in order to complete more turns of play. No player should sign up if that commitment of time is impractical for them; in addition, there will be a Friday night session prior to the Saturday mega-battle, from approximately 6pm until 8pm, in which all players will be asked to assemble at the HTUD Game Hall, make their deployment bid, and deploy their models onto the tables. This will allow Turn One action to begin almost immediately upon the store opening on Saturday. Players will *not* be excluded from participating in the mega-battle if they cannot attend this Friday night session--however their models will have to come on from Reserve beginning with Turn Two on Saturday unless the player can make some arrangement with his teammates to deploy his models by proxy on Friday night. Participants must insure they can play on the day without having to be responsible for non-participants in the Game Hall; space is limited, and is there for event participants. Note this in no way excludes parents from being present for their participant children, such oversight is welcomed; but participants should not sign up if *their* responsibility would include oversight of non-participant children--there is insufficient space and too much going on. Note also that this in no way excludes short term or visiting spectators; such support is encouraged for participants, as is the opportunity to show off the hobby to potential future players. The key words are 'short term' and 'visiting:' the Game Hall is not an acceptable venue for non-participants to eat, babysit, converse loudly, play laptop computer games or engage in other potentially distracting activities on a day when it has been reserved for a mega-battle; the participants in that event have devoted a great deal of time in preparation for same, and deserve a venue conducive to fully enjoying it. Each side may include Apocalypse Strategic Assets from either the rule book or Reloaded in their 13,000 point army list at a cost of 250 points each, but must have any they desire preapproved by an event moderator before game, as some may be excluded from play *or* may be awarded to one side or another at no cost immediately prior to Turn One start. Some of these rules of participation *are* keenly-drawn. No offense should be inferred by any participant which a given rule excludes, however: in all cases, they have been imposed based on lessons learned in previous Apocalypse Lucky 13s events, with an eye toward insuring the most fun event possible within the time- and physical-limitations the HTUD Game Hall affords. Voluntary compliance to these pre-announced restrictions saves event moderators having to exclude participants who do not follow the rules from playing in future events, which neither person involved enjoys very much...and which runs counter to the whole point of Apocalypse, which is having fun on an enormous scale. Forrest will receive a limited edition Games Workshop 25th Anniversary figure case from HobbytownUSA (ideally, to store his created Formation in); Gama will receive a brand new Games Workshop publication from my personal collection (novel or background book, depending on what he does not have). *--for fairness, at an event I moderate. HobbytownUSA Dallas' 40K V5 Academy, which was free with the purchase of the new rulebook, concluded two successful evening skullsessions and practice games with the first fifth-edition tournament in the area, which in three rounds introduced the competitors to all three of the new Missions and Deployment Conditions. Thursday evening's session was attended by eleven hobbyists, with fourteen more on Friday; each received a customized 'V5 cheat sheet' summarizing the major change's from V4 to V5, and participated in exercises and practice games to familiarize themselves with most of those changes. The 'cheat sheet' will be made available to every hobbyist in the North Texas area shortly as a download at http://www.AdeptusNorthTexas.com. Twelve of the Academy participants entered the tournament on Saturday. The races of the forty-first millennium were well represented, with three Space Marine armies and a Daemonhunter inquisition force representing the Imperium, a craftworld and two Dark Eldar forces, two Tyranid hives, an ork horde, a Necron detachment and a Tau cadre completing the dozen (Chaos was inexplicably absent in any form...). Three players entered the final round undefeated: Juan's Tau and Jackson's Daemonhunters clashed on the Ancient Earthen Ruins top table--but when their struggle ended in a Draw, leaving them both 2-0-1 and tied for Second, the Overall Tournament Victory went to the only undefeated *and* untied player, Brady and his Tyranids. Over half the armies were fully painted, and several of those which were't because they were fielding new and not-yet-painted squads would have vied for top honours, had the rest of their armies been finished: Jeff's terrific-looking wraithbone-accented Eldar Guardians and Josh T's screaming-bright-red Ork trukk spring particularly to mind. In a sporting display, two-thirds of the armies received at least one vote for Favorite Army, and two-thirds of the players votes for Best Sportsman--and (although it was not prohibited), no one voted for themselves, which reflects that highly-sporting atmosphere. Brady's Tyranids, Josh S's Space Marines, Bill's Space Marines, Tommy's Dark Eldar and Eric's Dark Eldar all received multiple Favorite Army votes--but the clear winner was Juan's beautifully-executed (and perennial favorite) Tau. Brady and Jeff earned multiple Best Sportsman votes, and both Josh S and Bill accomplished the rare and laudable feat of being named Best Sportsman by all three opponents they faced--including each other! Kudos to these winners of an outstanding field, which also included Alex's Tyranids (Alex lost only once, also, making the Great Devourer's V5 debut an impressive 5-1), Blake's Necrons and Kyle's Space Marines; and thanks to Games Workshop and HobbytownUSA Dallas for hosting and supporting with fine prizes. The fifth era has begun! Comic Asylum in Garland will sponsor a 1500 point Warhammer 40,000 tournament Saturday, July 19th, 2008. The tournament will use V4 rules, but Chapter Approved armies as well as Codex armies can participate. The 'three colour standard' is requested (and required of any armies which wish to compete for the Best Army prize), and three printed copies of their army list are required of players. Comic Asylum is at 4750 North Jupiter Road in Garland; click on their store listing at left for additional contact information and tournament details!